There are many benefits to staying in touch with the Factor-Inwentash Faculty of Social Work: networking, professional development sessions, connecting with classmates, and mentoring future social workers. In addition, via the alumni listserv, we regularly send out information, relevant to the social work community, such as job postings, conferences, seminars, workshops, continuing education courses, etc. 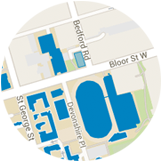 The University of Toronto respects your privacy. Personal information that you provide to the University is at all times protected in accordance with the Freedom of Information and Protection of Privacy Act. We ask that you please complete this form and provide us with your contact information after graduation. The continual prestige of our degree from the University of Toronto depends in part on strong alumni networks and sharing of expertise and knowledge with others. Our alumni play an important role in our Faculty and in our communities in Toronto and around the world. Do you give permission for the Alumni Association to share your e-mail address with the Practicum Office for future Field Instructor recruitment?